The list keeps growing on anime titles that are to get the Hollywood makeover. 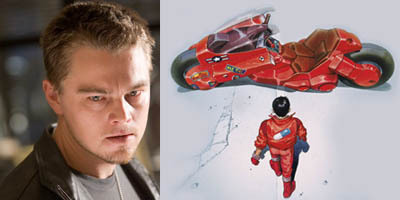 Whether that is good or bad is up to the fans but looks like the next anime to be a live action movie is Akira. What's even more interesting is the person who is going to produce the movie...Leonardo DiCaprio together with Warner Bros. I didn't know he was such a big anime fan... anyways, would have to agree with Danny Choo's take on the series, that of it being very gloomy. Set to come out during the summer of 09, add it to Transformers, Evangelion, Speed Racer, and Dragon Ball as the current list of anime titles turned into Hollywood movies. Expect even more once the American comic movies eventually lose their thunder. More on this via Dannychoo.com and Japan Probe. Thanks to Japan Probe for the picture.